Evelyn D’Souza, SCN, 69, died passed away on April 3, 2010, at 1.35 p.m. in Lucknow. The funeral Mass and burial was at Mokama on April 5, 2010. The Archbishop of Patna, Most Rev. William D’Souza, SJ, concelebrated the Mass with ten Diocesan priests and in the homily he said, “After having lived faithfully for 45 years as religious, Sister Evelyn has moved away from our presence to God’s presence. She did not gain much earthly acclaims but she had the pastoral care for the simple rural rustic people in her heart. No high degrees or national awards were attached to Evelyn’s life. Now she has been called for her crown of victory – the reassurance along with Jesus … her passing away was beautiful … simple, unnoticed, a life more pleasing to God”. During her 45 years of religious life, Sister Evelyn ministered in many places in India and in Nepal. She has been in community ministry at Mokama Nazareth Convent, Mokama Nazareth Hospital, Banakal as Dietician and Farm Manager. She was involved in pastoral ministry at Sokho and Biharsharif. Retreat ministry was Sister Evelyn’s passion and she worked at Arunachal Pradesh for some time. She was involved with Adult Literacy program at Dharan, Nepal. She was also active in the ministry of teaching in the schools at Gaya, Mandair, Mokama and Surkhet as well as in the initial Formation House, Ranchi. 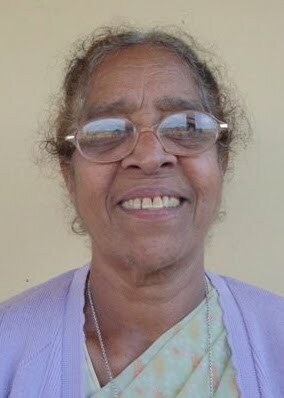 Evelyn was born of the late Cosses Pereira and Alex D’Souza on December 23, 1941, at Omzoor in the Diocese of Mangalore, Karnataka. Evelyn was the eighth child along with her twin brother of the 10 children. She is survived by her twin brother, Cyril, four sisters and her religious Community. In her own words, Sister Evelyn had written once to the Provincial that “I praise and thank God for assuring me and making me His own beloved daughter. I have upheld my people and my community. I carried my cross joyfully, faithfully and the Lord blessed me.” With this sort of deep spirituality and commitment she lived among us and drew people and us to God through her simple life of love and generosity.